Acupuncture is a medical therapy used for both humans and animals to reduce chronic pain and promote health and healing. The American Veterinary Medical Association has recognized acupuncture as becoming a more mainstream part of veterinary medicine. Additionally, the World Health Organization and the National Institutes of Health have officially recognized acupuncture as an effective treatment for many conditions and diseases. Veterinary medical acupuncture is the practice of inserting sterile, thread-like needles into skin and muscle at precise points on the body (acupuncture points). Acupuncture points are points throughout our body rich in neurovascular structures (veins, arteries and nerves). Science has shown that stimulating these points results in activation of our central nervous system. Once activated, our central nervous system modulates biochemical and physiologic functions which results in a therapeutic response: pain relief, release of muscle tension, hormone regulation, improved circulation and decreased inflammation. Medical acupuncture has been shown to be beneficial in the treatment of osteoarthritis, degenerative joint disease, intervertebral disc disease, nerve or spinal injury, hip and elbow dysplasia, skin infections and can be used as an aid in post-operative pain management and healing. 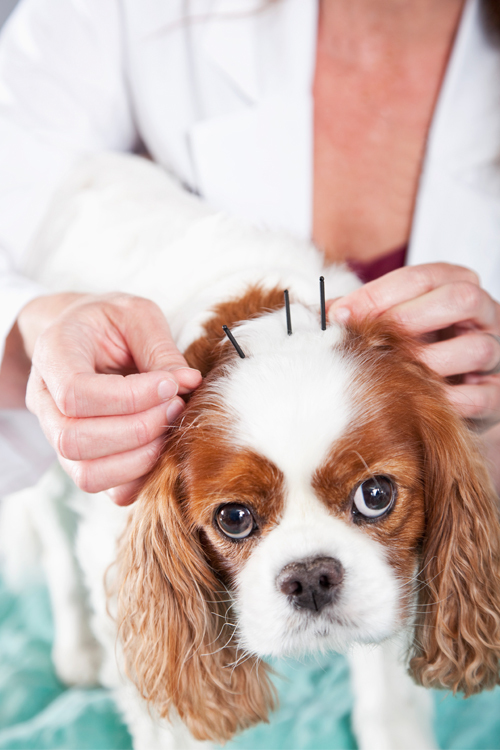 IS MY PET A CANDIDATE FOR ACUPUNCTURE? All animals can benefit from acupuncture. Any animal suffering from chronic pain, arthritis, muscle weakness or wound from trauma or surgery can experience comfort and an enhanced quality of life as a result of acupuncture. At your initial visit we will discuss your pet's medical history and all treatments, medications and supplements they are receiving. A thorough physical and myofascial exam will be performed to determine the overall health of your pet and to determine which acupuncture points will benefit your cat or dog. Most dogs and cats prefer to lay down during treatments however, some prefer to stand. We can insert needles in either position. Most animals do not feel the needles as they are inserted, but there are always exceptions. Our pets tend to be more reactive in very painful or sensitive areas therefore, can react as the needle is inserted. Once inserted most animals do not realize the needle is still in place. Once all the needles have been placed, some cats and dogs decide to take a nap, others we entertain and spoil with treats (dried liver, frozen peanut butter, frozen baby food, etc). If your pet has a food allergy or food sensitivity, please let us know. Each treatment session lasts approximately 20 minutes. Treatment may involve dry needle acupuncture, electroacupuncture or laser therapy in more sensitive areas. The acupuncture points treated vary from patient to patient and even from session to session depending on your cat or dog's current needs. Frequency of treatments will depend on the injury, illness or condition we are treating. Medical acupuncture is a safe treatment for animals when performed by a certified veterinary medical acupuncturist. Dr. Tanya is one of 8 certified veterinary medical acupuncturists in Ontario!